In the Spring of 2012, I went on a cruise with my wife and her parents. We were stopping in Nassau and I wanted to do something different. After some research I found that this is the home of Graycliff Cigars. My wife, her father and I decided that we would track this place down and hang out there for a bit. After getting off the ship, we began our trip on foot up random streets, dodging traffic and completely out of the way of the normal touristy shops. 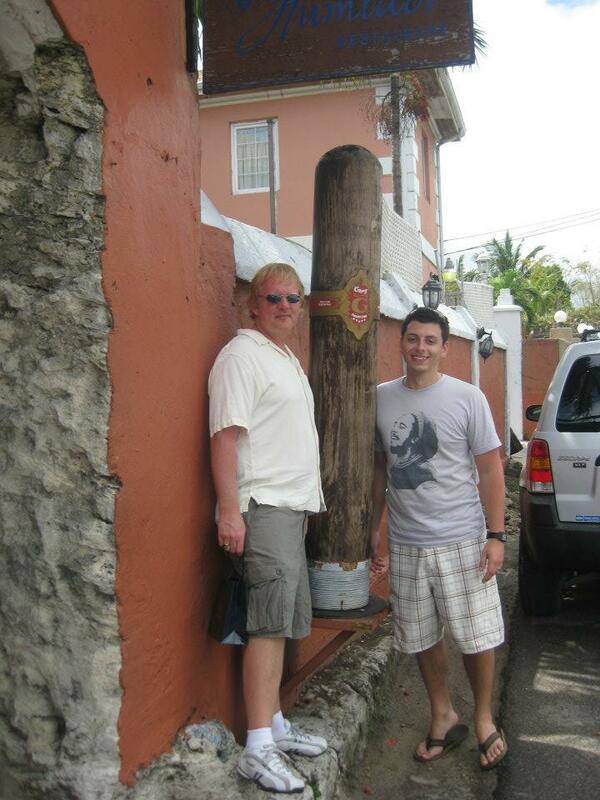 We came up to a block that had big walls and trees around it, and a giant wooden cigar statue out front. Found it! I called a few months ahead to make reservations as recommended on their website. When we arrived, they had no such reservations. They were great about it and still were able to accommodate us. My FIL and I decided that we wanted to do the rolling lessons and have a tour. My wife was allowed to tag along to take photos. The tour consisted of us going into the rolling room, a short explanation of their lines, and what leaf they use in what (I would not have been happy if I only paid for that). Next up was our rolling lesson. We were introduced to the only two torcedors currently there, as the rest were on their morning break. Like I said, they didn't know we were coming.. I forget her name now, but the lady that I was with was great at what she did (obviously) and was extremely nice. Since I'm great at saying thank you in Spanish, we really hit it off ;). She rolled a few for us so that we could watch before we sat down for ourselves. They said we can roll as many as we can within the time frame, and would be able to keep them. She assisted as I rolled the first one, but then allowed me to do two more completely on my own. I grabbed the filler and bunched them together, laid them down and wrapped them in the binder. Then I laid out the wrapper, trimmed it with the awesome blade, and wrapped it. She showed me the special cut needed to get the cap right and I was done! I wasn't as knowledge back then as I am today, so I really have no idea what we were using for filler, binder, or wrapper. My FIL apparently wasn't doing as good of job as me, and basically had his torcedor roll all of his for him. I, however, was like a pro, better just start calling me tobacco jesus. In the end, we only rolled 3 (what happened to as many as I can roll?!). We said our thank yous, tipped her for staying during her lunch, and said our good byes. From there, we visited the small store they had onsite. The store keeper talked to us a little, and mentioned how not very many locals stop by, because cigars are not very popular mostly due to not being able to afford them. And after seeing their prices there, I could understand. I just kept thinking, man I could buy the whole box of those from CI for only 5x as much as the stick cost! I picked up a few just to be nice and we went on our way. I regret not smoking one of those within the next few months to see how it was then. I kept saying I was keeping them for a special occasion. Fast forward 2 years and I finally smoked one! This was just the other week during Father's Day (my 2nd Father's Day as a father). It was fantastic. Had a perfect burn the whole way through, great spice and toasty flavor. I still have 2 left, and can't wait to see how they continue to age. All-in-all, I would recommend this stop to anyone. It's a great opportunity to see how a cigar is rolled, the differences in the filler, wrapper, etc. The Graycliff "estate" was actually a restaurant and resort that later decided it needed to provide cigars to it's guests (I believe that's correct). Nice post! You FIL is all tatted up! that's awesome!